The overwhelming majority of musicians reach the peak of their popularity and moment of glory before they turn forty. The Scottish singer, Susan Boyle, apparently does not prove this law as she reached the wide audience when she was in her late forties. A great desire to sing and confidence in her own abilities helped the artist to get prominent across the UK after participation in the TV project Britain’s Got Talent. Considering Boyle’s age, we could easily have assumed that she would not last long. There were no concerts, interviews or shows to follow that contest, which usually happens when an artist out of nowhere gets well-known everywhere. Indeed, Boyle spent a while out of the limelight, but she was smart enough to come back to the focus of the public interest in the right time. Just before the Christmas holidays, Susan delivered her debut long player, I Dreamed A Dream, named after the song that became her trademark. Before the record was officially released, it was ordered on-line in amount of thousands and thousands of copies, which shows how much anticipated the album was. I Dreamed A Dream is in many ways an unconventional album. It represents the case when a record can attract only with its music and nothing else. No massive promotion campaigns were held to support it. 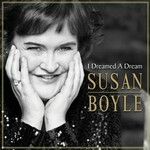 Susan Boyle was far from enhancing her image, which could only prove that she had nothing to offer, but her singing. But the singing deserves listening to it! The matter of fact is that Who I Was Born To Be is the only original track here. All the rest are covers of pop-music songs and spiritual chants. Whatever you choose, it will sound differently from the initial variants. Susan’s Crystal clean voice with inevitable sensation of grief is not just one of the album’s advantages, but it’s most powerful weapon. Even Madonna’s aggressive hit You’ll See, a statement of revenge-addicted person, here turns into music with a totally new mood and becomes a sentimental ballad. Rolling Stone’s energetic composition Wild Horses, originally with infectious drive, is performed by Boyle to make emotions, particularly sadness, the main highlights here. Susan is also good at doing church material, How Great Thou Art or Silent Night. There is a good reason for choosing them as such music is especially demanded in times preceding Christmas. Critics expect CDs like I Dreamed A Dream rubbing their hands with glee. There are things here to criticize and they are not difficult to detect. After all, not every one is fond of those who are concentrated on making covers instead of penning original material. Besides, I Dreamed A Dream lacks innovations in terms of music. This is calm music balancing between pop- and rock-music with a pleasant female voice. But isn’t it enough to make a good album? The decision to make covers in this case is reasonable. This is just the first studio work by Susan Boyle; and the choice of songs of various performers and trends would help her find her place in the world of music and understand what to do while making the subsequent album. As for the music itself, the singer’s vocals would not disappoint the listeners while the instrumental parts here were not aimed at revolutionizing anything. I Dreamed A Dream has no claims to the leading places, but is successfully doing its duties. This bright music record will definitely be a good match to the atmosphere of the upcoming holidays and is certainly a nice debut album.